Known issues on Windows Vista and later. 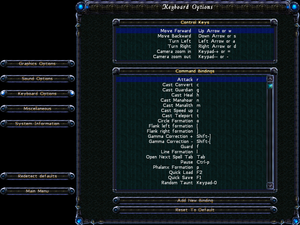 Prevents crashes and issues on modern PCs, in addition to adding new graphical options. Requires a GPU with support for DirectX 10.1 or above. Download the latest version of dgVoodoo 2. Extract the .zip file somewhere and copy the contents of the MS sub-folder into the main Sacrifice folder. 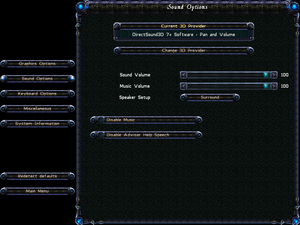 Use dgVoodooSetup to configure settings (Recommended to disable the dgVoodoo Watermark checkbox) and press ok.
Start the game, clicking ok when asked to choose a Direct3D Driver (each box should mention dgVoodoo). Labeled as "Triple Buffering". Disable GSYNC in the Nvidia Control Panel to avoid instant startup crash. The voice target framerate auto-tweaks the game, during intense situations, to reach at least the target fps. 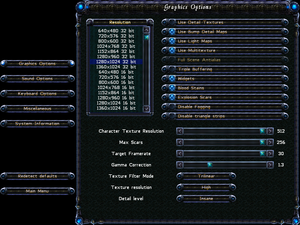 Double-Click on "Resolution" and change the first row of hexadecimal values to your desired widescreen resolution. values are entered in reverse order. For example 1920 is 07 80 in hexadecimal and would be entered as 80 07. 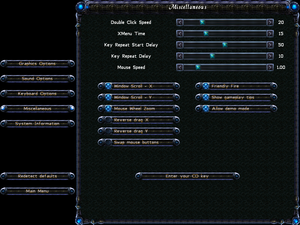 Select the key labeled "Target framerate"
Enter in as a decimal the minimum framerate you wish for the game to run at. Seems to apply negative mouse acceleration if 'Enhance pointer precision' setting in Windows is turned on. Unofficial translation by Fargus. 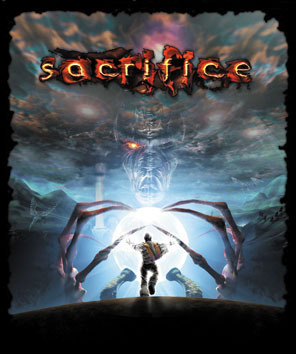 Attached as bonus to GOG.com version. ↑ 2.0 2.1 File/folder structure within this directory reflects the path(s) listed for Windows and/or Steam game data (use Wine regedit to access Windows registry paths). Games with Steam Cloud support may store data in ~/.steam/steam/userdata/<user-id>/38440/ in addition to or instead of this directory. The app ID (38440) may differ in some cases. Treat backslashes as forward slashes. See the glossary page for details. This page was last edited on 16 April 2019, at 01:50.